The access to and use of this website is subject to the following terms and conditions and all applicable laws which, by accessing and browsing this Site, the User accepts, without limitation or qualification. The information set forth in this site concerning any products or services are subject to change without notice. When you visit this Site to view content or download information, we may collect statistical data about your visit, such as date and time of access, your IP (internet protocol) address, referral links followed to the Site, and browser type. This information is statistical and not personally identifiable. We use this information to measure number of visitors and their use of the Site to help make the Site more useful to our Users. Corbin & Tapases, P.C. does not collect any personally identifiable information from browsers on this Site. In order to guard your nonpublic personal information, Corbin & Tapases, P.C. has implemented generally accepted standards of technology and operation security to protect personally-identifiable information from loss, misuse, alteration or destruction. Only authorized Corbin & Tapases, P.C. personnel are provided access to nonpublic, personal information, and such employees are required to treat this information as confidential. Notwithstanding these precautions, we cannot guarantee that unauthorized persons will not obtain access to your nonpublic, personal information. The information contained on this Site is provided by Corbin & Tapases, P.C. and is intended for general informational purposes. This Site does not create, establish or implicate a client, professional, fiduciary, accounting, legal or consulting relationship. Further, the information presented on this Site is not intended to constitute accounting, tax, legal, consulting, or other professional advice or services. As such, Corbin & Tapases, P.C. does not intend for the information contained on this Site to address individual matters or situations. The contents of this Site are not a substitute for the User seeking professional advice from a source that is informed about the User's factual situation or circumstances. All information on this Site is provided by Corbin & Tapases, P.C. "as is" and with no guarantees of accuracy, completeness or timeliness and without warrantees of any kind (express or implied). Further, Corbin & Tapases, P.C. does not guarantee that the Site will be uninterrupted, error-free, omission-free, or free of viruses. 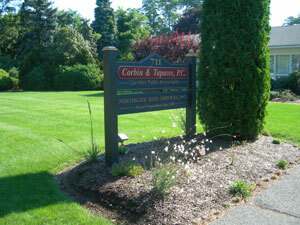 Accordingly, Corbin & Tapases, P.C.. disclaims all warrantees and obligations regarding this Site or any content accessed through this Site, including, but not limited to, all implied warranties and obligations of merchantability and fitness for a particular purpose, title and non-infringement of third-party rights. Corbin & Tapases, P.C. its affiliates, shareholders, directors, employees and agents are not liable in any event for any direct, indirect, incidental, special, exemplary, consequential or any other damages without regard to the form of any action, including, but not limited to, contract, negligence or other tort claims arising out of or in connection with this Site or any content on it. Some links on this Site direct Users to third-party web sites. All links to third-party web sites are provided as a convenience to Users and are not controlled by Corbin & Tapases, P.C. Our decision to link to a third-party web site is not an endorsement of the content or services in that linked third-party web site. Corbin & Tapases, P.C. is not responsible for content or privacy policies of any third-party material that can be accessed through this Site.